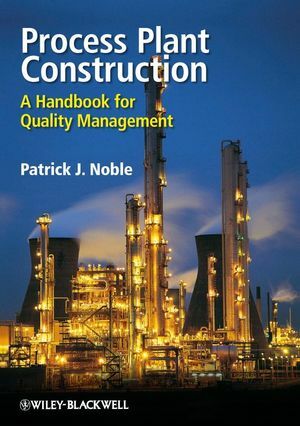 This handbook introduces engineers, project and construction managers, and senior technicians to a methodology for the management of quality on a process plant construction site. The eleven chapters of the handbook define the roles and appellations of the parties involved in a project as well as outlining the fundamental strategic and contractual orientations to be decided. The ISO 9000 series of standards are examined within the context of the process plant construction site. A study is then made of the roles of the organizations involved and of the interfaces between them. Special attention is given to document and materiel control, followed by a review of the various monitoring and feedback systems to keep the project on track moving towards the ultimate goal of satisfactory construction completion leading to turnover. Model procedures are proposed, complete with forms attached, and a number of case studies are included to illustrate the practical application of the principles presented. Process Plant Construction: a handbook for quality management is completed by appendices covering Civil Works & Buildings, Mechanical Equipment, HVAC, Welding, Structural Steelwork, Piping, Electrical Installation, Instrumentation & Control, Painting, and Thermal Insulation. Each appendix, aimed at the non-specialist, presents briefly for the discipline concerned the nature of the works likely to be met on site, evokes the parties involved and highlights quality issues to be addressed. Typical inspection and test programs are outlined. Patrick Noble, BA MBA CEng MIEE MIMechE, has worked for consultants, contractors and owner organizations on process plant projects worldwide. With some 35 years of experience, his responsibilities have spanned a number of domains, in particular that of quality management of construction, which has enabled him to identify the essential issues and challenges present on site and to put forward in this handbook simple, realistic and credible responses. 1.2 Materials, Equipment, Materiel & Works. 2.4 The Rationale for Formal Quality Management Systems. 2.5 Certification of a Quality Management System. 2.6 Quality / Occupational Health & Safety / Environment. CHAPTER 3. ON-SITE RESPONSIBILITIES & INTERFACES. 3.11 Plant Extensions & Modifications. CHAPTER 4. THE EPCM CONTRACTOR. 4.2 The Corporate Quality Manual. 4.3 Creating the Site Quality Plan. 4.6 The Site Quality Assurance Manager. 4.7 Responsibilities for Quality Control. 5.2 Selecting the Construction Contractors. 5.3 The Initial Site Meeting with Each Construction Contractor. 5.5 Inspection & Test Plan. 5.6 Procedures & Method Statements. 5.7 Inspection & Test Records. 5.9 Inspection, Measuring & Test Equipment. CHAPTER 6. CONSTRUCTION / ENGINEERING INTERFACE . 6.2 Types & Origins of Engineering Documents. 6.3 EPCM Contractor Specifications & Drawings. 6.5 Construction Contractors’ Specifications & Drawings. 6.6 Engineering Standards & Codes of Practice. 7.5 Incoming Inspection, Ongoing Inspection & Maintenance. 8.1 What Are Nonconformities and How Do We Manage Them?. 8.4 Few or Many Nonconformity Reports. 9.2 Guidelines for Auditing, Including a Model Procedure. CHAPTER 10. MANAGEMENT REVIEWS & COMPLETION REPORT. 10.2 Management Reviews on Site during Construction. CHAPTER 11. CONSTRUCTION COMPLETION & TURNOVER. 11.1 Activity Phases on Site. 11.3 Responsibilities of Parties Present. 11.5 Procedure for Turnover to the Owner. 11.6 Construction Completion & Turnover by Functional Systems. APPENDIX A. CIVIL WORKS & BUILDINGS. APPENDIX C. HEATING, VENTILATION & AIR CONDITIONING. APPENDIX H. INSTRUMENTATION & CONTROL. The Model Forms (Word Documents) for this book are stored in a ZIP archive. You may require "Winzip (PC) or "Stuffit Expander" (Mac) to access these files. If you are unable to view the Word documents, you can download the free reader from Microsoft.